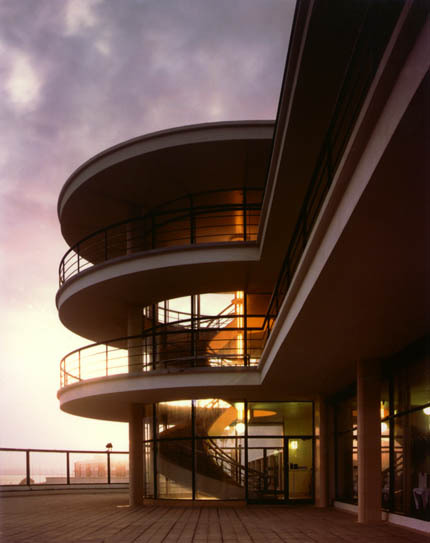 The pavilion was built by Earl De La Warr when the modern was only just beginning to be the accepted architectural style of social progress. 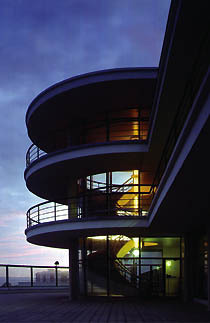 Earl De la Warr, the socialist mayor of Bexhill-on-Sea, drew up a brief for a building simple in design, light in appearance, with large window spaces, sunbathing terraces, a restaurant, a reading room, a multi-purpose entertainments hall: a modernist dream building by the seaside. De La Warr Pavilion was to be the first large scale welded steel-framed building in the UK. The competition announced by Bexhill Corporation attracted 230 entries, and was won by one of the giants of European architecture, a revolutionary and visionary, Erich Mendelsohn - famous for his Einstein Tower in Postdam and his Schoken department store in Stuttgart. (See also his Mossehaus in Berlin.) His local partner would be Serge Chermayeff. 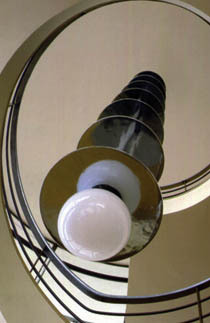 The building is recognised as the perfect expression of the Modern movement in 1930s Britain. The pavilion – housing entertainment and conference halls functions rooms, a library and a terrace restaurant – was completed in 1935. It was the first public building in Britain designed and built on International Style principles, an inspiration for the Royal Festival Hall, London and one of the few surviving buildings designed by Mendelsohn. “The interior is truly music,” as the Earl said to the architect during the final stages of the De La Warr’s construction. After the Second World War the pavilion fell into disrepair, its render crumbling, its metal crushed from the salty sea air and covered in scaffolding. In early 1990s the architect John McAslan started its restoration. The pavilion faced problems both of serious physical decay and of adaptation to changing ideas of entertainment and leisure. To secure the funds needed to repair and regenerate the building, its perceived role had to change, from that of a local amenity to a regional arts centre, attracting audiences from a wide stretch of the south coast and its hinterland. So, alongside the much loved theatre, there is to be a new gallery, reflecting an ambitious new exhibitions programme. One of the basic problems is that the pavilion is relatively small – it was part of a far larger scheme, abandoned after the Second World War. Public spaces have been colonized for offices and storage. Some extension of the building – proposed by Maxwell Fry over forty years ago – was judged vital. The chosen solution for the restoration was to construct a separate wing to the north, linked to the Pavilion at basement level, congruent in style but now a pastiche of the 1930s. For the building the original architects chose a welded steel structure. Inside, the pavilion felt like an ocean liner. Its walls were painted ivory-cream, floors covered in cork or cream terrazzo. People sat on bentwood chairs at beechwood tables with white lino tops lit by Bauhaus globe lamps. All those details have been carefully restored by John McAslan. The pavilion is a Grade 1 Listed Building in the UK Government scheme for protecting important buildings. The original architect's model is on display in the main gallery of Bexhill-on-Sea Museum. 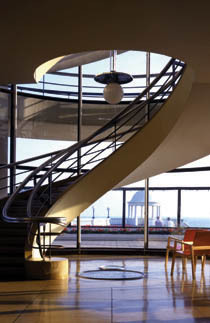 The De La Warr Pavilion re-opens in October 2005 as a national center for contemporary art. By train: you can reach Bexhill-on-Sea on the Hastings line from London Victoria. Walk down Sea road, turn right and along the marina for approximately 150 meters. The pavilion is set back from the promenade overlooking the sea. By car: take the A259 from Brighton to Bexhill-on-Sea, follow signs to the pavilion on the Marina. The pavilion is open 10am-6pm, 7 days a week (from October 13th 2005), and in the evenings for programmed events. 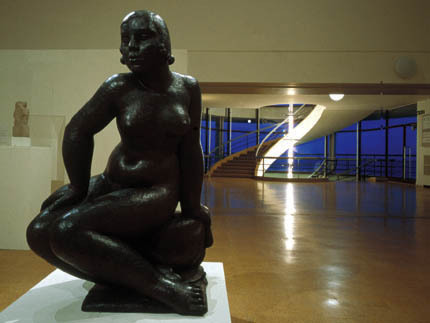 For further information please call +44 1424 787900 or visit www.dlwp.com. For further information about the restoration project please visit www.mcaslan.co.uk.